Nickel plating is the process of electrolytically depositing a layer of nickel. Parts processed with a bright nickel plating layer maintain their surface appearance and brightness over time. Nickel is extremely resistant to atmospheric corrosion, making it an excellent choice as a final layer. 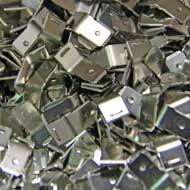 Nickel is also a magnetic material, making it an attractive option when magnetic properties are required. Nickel can provide improved wear resistance to soft metals such as copper, resulting in longer service life. Nickel also provides a superior barrier layer between metals that can experience self diffusion into each other such as copper and tin. High purity nickel is used in electronic and aerospace applications, chemical and food processing equipment, for anodes and cathodes, caustics evaporators and heat shields. Nickel is also electroplated onto base metals when making glass-to-metal seals and also for metal to ceramic seals. Common nickel plating baths are sulfate, chloride, fluoroborate and sulfamate based. The choice depending upon the desired properties of the deposit. Note: In general, electroplated nickel's corrosion resistance is strictly a function of thickness. Depending upon the additives to the nickel plating bath, all chemistries can provide finishes that range from matte through semi-bright to bright in luster. Typically, the brighter the finish, the more stressed the deposit is and the less that can be done as a secondary operation to the deposit. The very low stresses inherent in a Sulfamate Nickel deposit make it ideal for barrier coats. Hi-Tech Plating offers Bright Nickel as well as Sulfamate Nickel. Sulfamate has much better ductility. Nickel has only fair electrical conductivity (25% that of copper) and heat conductivity. Nickel resists corrosion and most acids, but is attacked by oxidizing acids such as nitric acid. Hi-Tech Plating offers both Bright Nickel and Sulfamate Nickel per specifications QQ-N-290, MIL-P-27418 and AMS-2424. Contact Hi-Tech Plating today and put our expertise to work for you today. Nickel was the first commercially available electroplated finish. It was used on firearms as far back as the 1840's in Germany. Most meteorites contain between 5 and 20% nickel. Nickel is a silvery-white metal and takes on a high polish. U.S. nickels contain 25% Nickel 75% Copper. In 2007 the value of the nickel metal in a nickel was 7.5 Cents. Nickel is hard yet relatively malleable and ductile. Nickel is used to make green colored glass. The word "nickel" derives from the old German Kupfernickel: Devil's Copper or Old Nick's Copper or False Copper.